In order for your team to reach its true potential on the basketball court, they must maintain the strength they built throughout the entire offseason. As obvious as it sounds, strength training is still a greatly underestimated aspect of preparation in many programs and often a neglected component during the actual playing season. Just remember, your players are not Olympic lifters, power lifters, or bodybuilders, so they need not train that way. A safe, time-efficient and productive in-season program can take as little as 20 minutes twice a week. The primary purpose of a strength training program is to reduce the occurrence and severity of injury. Basketball is very demanding physically. Making the muscles, ligaments, and tendons of the body stronger will lessen the occurrence and/or severity of an injury (such as a pulled groin or rolled ankle), and keep your players on the court. Further, you will improve their performance on the court. The stronger your player is, the more force they can produce. The more force they can produce, the higher they can jump and the faster they can run. But most importantly, strength is an attribute that can quickly diminish. In as little as three weeks your players may have a noticeable decrease in strength. That means every week that goes by, your team is getting weaker. Come playoff time your team will be physically at their weakest when you need them at their strongest. There are as many different strength training methodologies as there are ways to run a full court press or a fast break. Regardless of what you choose, safety, time efficiency and intensity should be the backbone of your strength training philosophy. Your main focus during the season should be to maintain (if not improve) each player’s overall muscular size and strength. Your in-season program should address their major muscle groups (legs, hips, core, and upper torso) as well as paying special attention to the most injury-prone areas: ankles, knees, groin, lower back, and hands. Your goal as a coach should be to minimize risk within the training atmosphere. You should only use the safest exercises available, and do your best to make sure that all workouts are properly supervised. 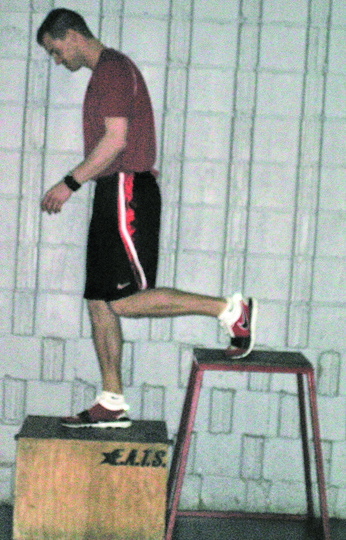 Players should always perfect exercise technique and form prior to utilizing additional resistance or weight. Additionally, players should perform every movement in a slow, controlled, and deliberate fashion, with special emphasis focused on the lower portion of each lift. Lastly, your players should work within an appropriate repetition range (8-15 reps for most high school and college basketball players) and avoid maxing out (seeing how much weight can be lifted in one repetition), as these practices can be very dangerous. Time is a precious commodity for both you and your players, especially during the season. Therefore, the goal of your in-season strength program should be to get the best results possible in the shortest amount of time. You should use a limited number of sets and exercises during each workout (1-2 sets per exercise), while minimizing rest intervals (very little rest in between sets) to induce an overall conditioning effect. This will make each workout brief, but intense. Intensity is the most important controllable factor in determining the results for your players. Below a certain level of intensity, strength training will have very little benefit. I define intensity as the level of effort exerted by the individual being trained. If a player is capable of lifting 100 pounds 15 times and they stop at 10, the exercise was clearly not as intense as it could have been. Therefore, it is recommended that each set is taken to the point of momentary muscular fatigue--the point at which no additional reps can be completed. As you can see, there is not much difference between your off season strength training philosophy and your in season philosophy, with the exception of the volume. Given your players will be practicing and playing almost every day (at high levels of intensity) and will be in a constant state of fatigue from November to March, it is recommended you decrease the volume of each workout to reduce the overall wear and tear on their bodies. Do fewer sets and less total exercises, especially for the lower body. While you certainly want your program to have balance, and work all muscle groups, the core is extremely important to staying injury free and performing well on the court. The core consists of the abdominals, lower back, obliques and hips, and is the center of all movement--which means core training is extremely important for basketball players. A strong core may help prevent hip and lower back injuries (which are especially common among taller players). Manual resistance exercises are a fantastic tool to use during the season, as they require no equipment, can be done anywhere (which is great when your team is traveling), encourage communication among players, and are an effective way to build and maintain strength. Manual resistance exercises are strength training exercises in which a partner or coach applies the resistance instead of using weight such as a traditional barbell, dumbbell, or machine. It is important to make sure that you and each member of your team understands the concept of manual resistance, so that the exercises are as productive as possible. Further, it is important that your team performs these exercises correctly, learning to apply resistance evenly throughout the entire range of motion and making sure that there is resistance on both the positive and negative portion of exercises. The responsibilities of the lifter include performing slow and controlled repetitions, pausing at full contraction, and giving constant tension through a full range of motion. More specifically, this means that they need to “push or pull” against the tension the spotter provides on the positive part of the movement and “resist” against the tension on the negative portion. A common mistake many players make is not resisting during the negative of exercises. The responsibilities of the spotter include applying variable resistance through the entire range of motion and making sure the lifter keeps good posture. It's a weight-loss world. People of all ages are constantly trying to shed pounds, to tighten their frames and to make the scale spit out a smaller number. It's a billion-dollar industry. So it's a bit awkward that so many young basketball players actually need togain weight. If you're a teenage basketball player who's too skinny, you're hardly alone. Teenagers--both boys and girls--often feel like they're too underweight to play basketball to their highest ability. That's especially true for those who are tall and are forced to play physically in the paint. "With adolescents, there's so much energy expended in growing taller, there's not a lot left over to grow out," said Becci Twombley. "That's a big issue." Twombley is the nutritionist for the UCLA athletic department, and it's her job to make sure the Bruins' athletes are doing everything they can to add good weight to their often lanky frames. From the time they enter high school until they're around 21 years old, some basketball players can eat whatever they want, as much as they want, and not gain a pound. While it's an uphill battle for a body that's still finishing its final growth spurt, there are things you can do to try to pack good weight onto your frame. First thing's first: eat a good breakfast. Before diving into a diet reconstruction, Twombley insists that without starting the day with breakfast, you don't stand a chance of putting on good weight. "A lot of people get up and leave the house without breakfast," Twombley said. "Make sure you eat a big breakfast, not just a banana on the way out. Have oatmeal with sliced bananas, maybe some walnuts, a yogurt, a piece of fruit." From there, set up your eating schedule so that you're consuming calories every three hours, instead of just three meals a day. Breaking up your eating into six meals gives you the opportunity to eat more calories. And calories are the key to any good weight gain. "Don't eat so much at one sitting that you're not going to be hungry in three hours, because if you're overeating at one meal, you're going to be able to go six hours without eating," Twombley said. "The reality is, you can fit more calories in if you're eating every 3-4 hours during the day." Trail mix, which is a great grab-and-go snack with a lot of varieties available. Avocados are a great food for those looking to gain good weight, due to its "good fat" content as well as Omega 3s. Avocadoes can be added to sandwiches, burritos, salads and other normal meals. "A lot of my guys like to eat junk food," Twombley said. "They like to eat Doritos or chicken wings or chicken fingers with ranch dressing. Even though those are calories, they aren't functional calories so they don't actually do anything for them. If they eat them, they'll burn off really quickly because they have these great metabolisms and they're working so hard. But they're not getting the results they want to get." So how many calories does an underweight player need? It depends on several factors, including age, maturity level and existing muscle mass. At UCLA, Twombley notices that most of the men's basketball players in need of weight gain can eat between 4,000 and 5,000 calories a day. Female basketball players looking to add weight don't need as many calories as the guys because of less muscle mass. But at UCLA, they can still average between 3,000 and 4,000 calories a day. While proper nutrition is key, it's also important to build muscle mass through strength training. Alan Stein, the strength coach at basketball power DeMatha, says that the main component to weight gain is nutrition. He also said that from a strength training standpoint, he doesn't do anything special for players who specifically need to gain weight because "95 percent of all high school basketball players need to gain muscle mass and get stronger." Lift like a bird, look like a bird. You need to progressively add resistance in order to get stronger and gain muscle weight. Don't be afraid to push weight! You should aim for a weight that is challenging to get 10-12 reps. Those last few reps should be really difficult. If you are still lifting the same weight 60 days later, you haven't gotten any stronger. Get more bang for your buck. Don't bother with lateral raises and curls. Perform multi-joint exercises that work several muscle groups at once. Chest presses, shoulder presses, pull-ups, and rows for your upper body; and squats, deadlifts, lunges and step-ups for your lower body. You are not an Olympic lifter or bodybuilder, so don't train like one. Strength training for basketball is a means to an end, not an end itself. You need to train for the demands of the game, not for show and not for skill. Doing three sets of concentration curls will do nothing to help you on the court. Your body functions as a unit on the court, so it should do the same in the weight room. So you've got a plan in place, either through research or hiring a dietician or following some new guidelines. For males under the age of 18, a gain of ½ pound a week is ambitious and may be a challenge. For males over the age of 18 who have reached their peak height, you can gain a pound a week or more until you're around 20 years old. For females, it's hard to gain much more than ½ pound or a pound a week. It's important to realize, though, that there's no magic formula. Sometimes, your body won't respond like you want it to. At least not yet. "Sometimes we'll get guys that come in at 18 or 19 that are still thin, but by 20 are filled out," Twombley said. "They're training just as hard, they're eating just as well. It's just that their bodies are now catching up." Through the right nutritional habits coupled with strength training, you can maximize your potential to gain good weight. Beyond that, though, it's up to your body to respond favorably to your changes. You've been working hard on your game. Your handles, your jump shot, your pull-up J -- it's all coming together. That's great, keep at it! But there's an area of improved performance that most people don't even consider: nutrition. Eating right will help you perform at your highest. It will help with recovery from tough games, practices, and lifting sessions. Proper nutrition is also HUGE in putting on strength and size. After all, you can't build a bigger house (body) without having enough bricks (calories). I'd love to sit here and tell you that I want you to have a few servings of chicken breasts and broccoli everyday. But I'd bet on the Washington Generals winning a title before I'd bet on the chicken breast/broccoli combo happening with any consistency. I mean, I have a difficult enough time getting my adult clients to follow my nutrition advice. There's no way I'm getting a 16-year old that is used to eating fast food, soda, and Twinkies (as their staple), to jump on the lean protein, fruit 'n veggie, healthy carb and healthy fat bandwagon. With that in mind, it's going to take some work to make this whole nutrition thing work for you, rather than against you. Let's find out how to make it happen. When most people think of healthy food, they think of boring, bland and nasty tasting food (i.e. the chicken and broccoli mentioned above). Well I'm here to tell you it doesn't have to be that way. There are many great recipes out there that are both healthy AND tasty. I believe Gourmet Nutrition is the best resource out there that delivers that coveted tasty and healthy combination. At our house, we make meals that come from this cookbook on a weekly basis. Tip No. 1: Find a way to make healthy foods taste good. It is the only way (for most people) that you are going to stay with it over the long haul. Parents are the ones that are bringing the food home. So it is up to them to supply their children with fuel that will contribute to improving their kid's health and performance. It is pretty difficult for the athlete to properly fuel their body when they open their cupboards up to a bunch of chips and other snacks. And coaches, you have the ability to lead by example. If your athletes see a coach that works out and eats healthy, the chances of him/her following your lead goes way up. Tip No. 2: Parents and coaches, you have the ability to influence your kids in positive, or negative manner when it comes to living a healthy lifestyle. The choice is yours. This tip is quick and to the point. Teenagers seem to have a bottomless gut! If you cook for just the meal at hand, then you'll be falling behind. With all of the games and practices kids play, they NEED to constantly be eating good quality foods. The easiest and most convenient way to do this is to cook in bulk and store the leftovers for later. This seems like such a simple tip but believe me, this can make or break you nutrition-wise. Tip No. 3: When cooking, cook for the meal at hand, and make extra for the next few days to come. This will make life so much easier, and increase your chances for "nutrition success." If eating healthy is just too boring for you, look into the Gourmet Nutrition cookbook. Parents and kids NEED to work together to make the above tips work. Together, you CAN use nutrition to help take your game to the next level! Optimum performance on the basketball court requires sound nutritional habits, as being adequately fueled directly affects your stamina and focus. You can get your daily requirement of nutrients and calories through everyday food. It is rare to need the use of supplements, with the exception being weight-gain shakes for those of you who have trouble consuming adequate calories to provide for muscle gain. You should most certainly steer clear of performance-enhancing supplements, such as creatine and ephedrine, because of the possible side effects. A balanced diet consists of approximately 60 percent carbohydrates, 20 percent fat and 20 percent protein. Limit the intake of fat, sugar, and sodium. Drink plenty of water. Many nutritionists recommend a minimum of 64 ounces of water per day. Eat 5-7 small meals throughout the day. The size of the meal depends on the actual goal (weight loss vs. weight gain), as well as level of activity (two-a-days versus regular practice, tournaments versus regular games, etc.). Most basketball players are tall and slender, and are looking to add muscular bodyweight. In order to gain weight, you must consume more calories than you expend on a daily basis. This means if you are looking to put on weight, you must eat, eat, and eat! Now for the select few looking to lose weight (i.e. reduce body fat), they must do the opposite -- consume fewer calories than they expend. This is done by controlling their portion sizes. Breakfast: Orange juice, four pancakes w/syrup, and four scrambled eggs. Snack: one cup of low fat yogurt, granola bar, and a banana. Lunch: two deli sandwiches on whole wheat bread, an apple, and a glass of milk. Snack: two peanut butter and jelly sandwiches and a glass of milk. Dinner: Steak, potatoes, steamed vegetables, and a roll. Breakfast: Granola with dried fruit and milk. Snack: two cups of instant oatmeal. Lunch: four slices of cheese pizza and a salad. Snack: Trail mix: peanuts, raisins, and dried fruit. Dinner: Pasta with meat sauce, garlic bread, a vegetable, and milk. If you're on the sidelines with an injury, there is no chance that you are improving your game. Taking a proactive approach with injury prevention could be the difference in you becoming a good player, or staying an average player. Or maybe a big factor in what allows you to eventually become a GREAT player. Over the last few years there have been some great strength coaches talking about the importance of "ankle mobility." Unfortunately, when I take a look around at most gyms and high schools, the message is not getting out there. As strength coach Mike Boyle brought to the forefront, some joints are made for mobility, while others are designed for stability. You see, if one joint loses mobility, we are going to go to the next joint to find this mobility (a joint that is meant to be stable, NOT mobile). So, if you are asking a joint designed for stability to become more mobile, then you are asking for trouble! In regards to basketball players, this means that if we lose ankle mobility, the knee will have to "pick up the slack" and move more than it is designed to move. The knee joint is supposed to be a stable joint. And when we ask it to become mobile, guess what happens? Have you heard of the dreaded ACL injury? Ask your dad about how many of his teammates were sidelined "back in his day," with ACL injuries. Today we are much smarter, doctors have had many years to get more research in, and technology has greatly advanced. In the old days, without all of these benefits, I'm sure your dad will tell you at least half of his team tore an ACL at one point in their career, right? Wrong! Back when Pistol Pete and Oscar Robertson were on top of the basketball world, there wasn't even an ACL problem. And today people seem to be going down with ACL injuries left and right. What's going on here? I have no doubt this will surprise you, but here is a big problem: high-top shoes, ankles braces, and excessive taping of the ankles. We've gotten to the point that we put so much "gear" on the foot/ankle that I'm surprised our ankle can move at all. As I mentioned above, when we lose this range of motion in our ankle, our knee joint is the joint that is going to become more mobile. And this is a recipe for disaster. Pistol Pete (and your dad) used to wear All-Star Converse--the good 'ole Chuck Taylors! These were shoes that did not restrict range of motion at the ankle. They didn't have this fancy "air" cushion at the heel--the more the heel is elevated you end up losing "dorsiflexion" range of motion. We have basketball players wearing these restricted high-top shoes and ankle braces on the court. And now (again, ever since Air Jordans become popular) we have players wearing Jordans in school all day, going to the movies with their friends, and out on dates with their girlfriends. And here is another problem: when your foot/ankle are dependent on the support provided by the high tops and ankle braces, the muscles basically stop working as they no longer need to work. The shoe and brace do all the work for you. In college, we had to wear ankle braces to every practice and every game. When I finished my college career, loving the game like I do, I continued to play quite a bit. There were times that I forgot to bring my ankle braces with me for pick-up games. And seriously, I could barely make it up and down the court one time without tweaking my ankle. My ankles had gotten so weak from the braces, that they couldn't support me at all. I'm not going to suggest that you wear low-top shoes every time you play basketball for now on. What I am going to do is suggest that you wear shoes that mimic a barefoot feel as much as possible. And, I always walk around my house barefoot--get your shoes off whenever possible! You should be wearing the "Nike Free" shoe, and/or Chuck Taylor's when you are just walking around school, or hanging out with friends. Also, when you are in the gym lifting weights, wear these Frees or Chucks every time. Another smart thing is to go barefoot while doing your warm-ups (walking lunges, high knees, leg swings, etc) before lifting. Not only will this help you improve your range of motion of your ankle, it will help strengthen those muscles that were once dependent on your high-top shoes and/or ankles braces. Before lifting, I have all of my basketball players performing ankle mobility drills. Below you will see two videos demonstrating how to do them. Depending on how limited your range of motion is, perform 2-3 sets of 10-15 repetitions. For the single-leg ankle mob, make sure to keep the heel of the forward leg flat throughout the movement. And for the mobilization that involves both legs at the same time, elevate your feet onto two 5-pound plates. Once again, keep your heels flat throughout. With both exercises, make sure you do NOT shift your weight towards the inside of your foot or toes. Do you want to have an extra edge over your competition? Do you wish you were a step quicker? Would you like to start blowing by your defender? Here are some of my favorite foot-quickness drills that you can do anywhere as long as you have a decent pair of shoes, a stop watch, some tape or a line, and a whole lot of heart. If you practice these drills two or three times a week, with one day of rest in between, I guarantee you will develop quicker feet and become a more explosive basketball player. Keep this in mind for all of these drills: Select three of your favorites and perform two sets of 5-10 second intervals. Your focus must always be quick ground contacts--not conditioning. Stand with both feet behind a line/piece of tape on a soft surface or gym floor. Explosively and quickly jump backwards and forward over the line while being light, quick and effortless on your feet. (Visualize stepping on hot coals). Repeat pattern for desired amount of time. Use a 1:3 work to rest ratio. Stand with both feet on the side of a line/piece of tape on a soft surface or gym floor. Explosively and quickly jump side to side over the line while being light, quick and effortless on your feet. (Visualize stepping on hot coals). Stand with one foot on the left side and one foot on the right side of a line/piece of tape on a soft surface or gym floor. Explosively and quickly cross right foot over left foot in an X pattern over the line while being light, quick and effortless on your feet. (Visualize stepping on hot coals). Be sure to alternate feet each set. Explosively and quickly alternate the left and right foot over the front of the line while being light, quick and effortless on your feet. (Visualize stepping on hot coals). Remember, reading these drills will not make you quicker. But actually performing them regularly two or these times a week will provide you with great results and a noticeable increase in your foot quickness and explosion. If you have trouble at first on some of the drills, don’t worry. Just slow yourself down until you master the movement. Always remember form before speed. It takes over 17,000 times to build a new habit so be persistent. All athletes need speed--particularly in a sport like basketball where the first player up and down the court can mean the difference in winning or losing a game. In the world of sports, the fastest, quickest athletes are usually the most successful. But exactly what kind of speed and quickness is best for basketball? Many coaches may place too much emphasis on "straight-ahead" speed by, for example, focusing too much of their attention on getting their athletes to run a faster 40-yard dash. In a sport like basketball, this isn't necessarily going to be the kind of speed that's going to make for a more effective player. Seldom, if ever, does a player run baseline to baseline in a straight line, and even if they did, a fast 40-yard dash might not equate to an effectively fast basketball player. Having fast top-end speed measured at 40 yards wouldn't necessarily make you as effective as perhaps being a bit slower in the 40, but having the quickness and explosiveness to be faster down the court (which is a shorter distance). Most sprinting in basketball starts from moving or "rolling" positions, not a stationary one. So, some of your training should be spent with that in mind. Performing your speed training from different starting positions such as turning and sprinting from a backpedal, accelerating from a side-shuffle, or running after getting up from the floor (simulating being knocked down and having to get up and hustle down the court) translates into more "real world" training for basketball players than simply lining up at one baseline and sprinting to the other. This doesn't mean there is no room in your training for that kind of sprinting. It may have a place in your conditioning program--to build, for example, speed endurance. But, don't confuse this type of training with working on your game speed. Before any speed work is done, an athlete must have adequate strength. Without it, you might as well be trying to get a car to go 100 miles per hour with a go-cart's engine. Studies have shown that weight training to build strength can improve running speed. We're not talking about building big muscles here. We're talking about building strong muscles that can help us produce speed. A basic strength-building program for speed includes strengthening the legs (calves, hamstrings, and quads) with exercises such as calf raises, squats, leg curls and extensions; strengthening the upper body with exercises such as dumbbell (bench) press, seated row, shoulder raises, bicep curls, and triceps extensions; and the core muscles (abdominals and back) by using regular crunches from the floor, stability ball crunches, oblique rotations, and back extensions. These basic exercises and more can help the basketball athlete begin to develop the strength necessary to build speed. Acceleration is the ability to increase velocity. The key here is how quickly you can increase your speed. This is perhaps more important in basketball than raw speed, because unlike a sport like track where all the athletes take off at the same time, basketball players must be quick to recognize when they must start a sprint--such as a rebound leading to a fast break--and then be able to accelerate quickly. In basketball, having the ability to accelerate from a stationary position or from a moving position is equally important. Drills such as learning the proper 45-degree body position to begin acceleration, or using the proper arm action in the sprint can be helpful in this type of training. Each of these seemingly simple, but often overlooked aspects to becoming faster can help athletes improve their acceleration. Training for speed without including deceleration training is like learning to drive a car very fast without brakes. Athletes need effective speed, and effective speed means being fast, but under control. When a basketball player dribbles fast down the court for a breakaway lay-up, she'd better be able to effectively slow down as she approaches the basket. Otherwise, she's out of control, and will probably miss the lay-up and perhaps even get injured. Braking or decelerating is extremely important to speed training--perhaps the most important skill in basketball speed training. This may seem counter intuitive to some, but in order to have effective speed on the basketball court, the athlete must be able to run fast, decelerate or slow down, and reaccelerate into a sprint, cut, or jump. Slowing down properly actually aids in the athlete's ability to reaccelerate. A fast, out-of-control player is not very effective in a game. So make sure that learning proper deceleration techniques are an integral part of your speed workouts. An extensive discussion about proper deceleration technique is complex and beyond the scope of this article. However, many experts suggest that two key components to good deceleration is in keeping nice flexed or bent knees, and in lowering the athlete's hips during deceleration--whether from a sprint or from a landing. When you have the ball, you control the game. The defense is at your mercy. You know exactly where you want to go and when you want to go there. This alone gives you a decided advantage over the defense. But adding an explosive first step to your arsenal can give you an even bigger advantage. Quickness is one of the top three traits for a basketball player. The quicker you are with the ball, the more of a threat you are as an offensive player. In order to be quicker with the ball you need to utilize game speed ball handling drills and quickness/reaction drills in your training program. These drills add an element of reaction. The ability to read and react to visual and audible cues is important in the game of basketball. The following three drills will improve your quickness, agility and reaction time. Perform two to three of these drills twice a week during the offseason. The time each drill is performed and the rest time between sets can transform each drill from a quickness drill to a conditioning drill. Because there’s a time and place for conditioning, make sure to stick to the prescribed times to keep these drills improving your quickness so you can achieve the most benefit for your first-step and scoring ability. Coaching Point: Your partner should vary the hand he uses on throws and constantly change-up the pattern. For example, throw left hand, left hand, left hand and then right hand because it’s much more unpredictable then throwing left hand, right hand, left hand. This forces you to react faster and improve your first-step. Coaching Point: Don’t ever cross your feet and make sure to stay low with your chest up and your hands up and active. You have to stay low to the ground so you can reach the ball and tap it back to your partner. Your hands should be in front and active like they are in a game so you can catch a pass or grab a rebound. If your hands are in by your sides you can’t do these things in a game and you can’t perform this drill. And most importantly, work hard. Your intensity of effort during this drill is crucial. • The natural rhythmic pattern of having to turn the rope and jump/bounce at the same time, there is a major coordination factor involved. 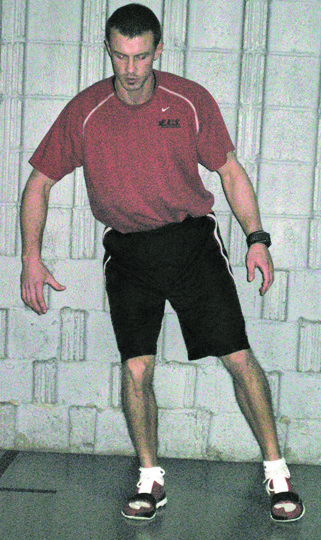 • Quick contacts with the feet force athletes to stay on the front half of their foot - thus improving the "elasticity" of the lower leg (this means quicker and more explosive!). If you're already good at jump roping and you're looking to improve your jumping ability one of the best drills I know are the double jumps. Start like Quick Feet except instead of doing only one turn of the rope you will make two turns of the rope each time you jump. 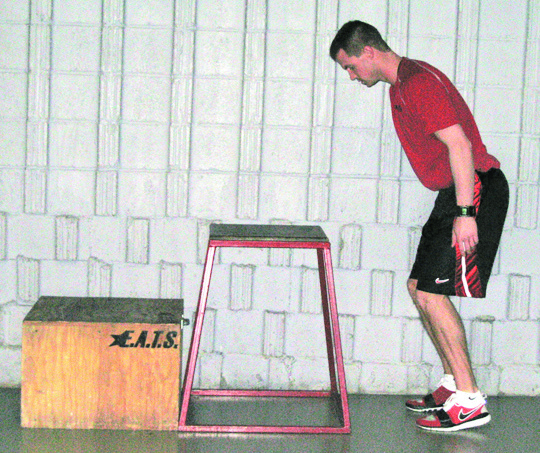 Because of the height you are jumping it works great at improving the power in the lower leg (picture higher jumps).